In their tightly disciplined and carefully ordered society, the Victorians loved nothing more than a Gothic mystery. Perhaps it was their only escape from the stuffy drawing rooms, the starched collars and the excruciating corsets that all but smothered any natural human impulses at birth. After all, this was the era of the Bronte sisters and Mary Shelley, of Dickens and Tennyson and Hardy, bold writers who fused passion with tragedy and were adept at wringing the last hopeless tears out of a reader’s heart. So, when the riddle of the Lost Falls was first dropped into polite conversation sometime in the late 1800s, it caught like wild fire. Everything the Victorians craved was right here: romance, danger, suspense… and the glory of Empire. Women were captivated, and if their husbands were unmoved by the first, they were galvanised by the last. Tracing rivers from source to delta was one of the chief obsessions of 19th century explorers; in Africa, the Nile and the Congo had already lured many to a horrible death. In India, the most provoking question was posed by the Brahmaputra, whose winding course was as yet unknown. And there was an extra factor, a tantalising element that had these gloriously moustached gentlemen scratching their heads in perplexity. They knew where the Brahmaputra emptied into the Bay of Bengal… but where did it begin? 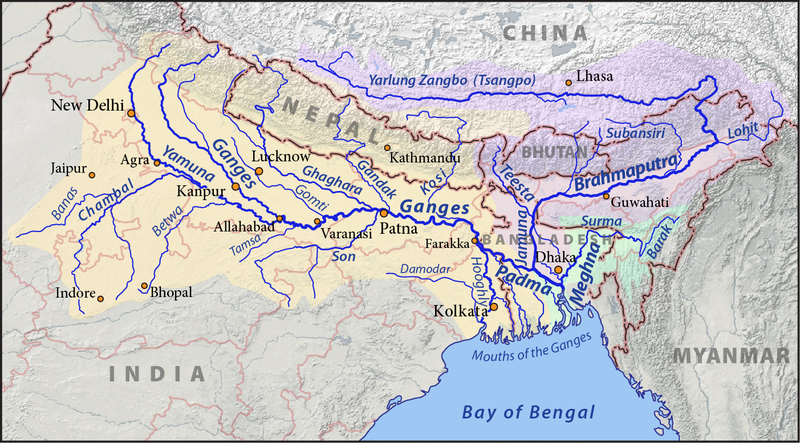 And if, as they suspected, its source was the Tsangpo River in Tibet, how on earth did it descend to the plains of Assam in a space of only 150 miles? The only solution was a waterfall on an almost unimaginable scale, perhaps a thousand feet high or even more: and it took only a short leap of faith to conjure the Lost Falls of the Brahmaputra. The next challenge was to find them. Fed by the icy waters of Himalayan glaciers, the Tsangpo river has carved a deep chasm through the highest mountains in the world. As it descends from the Tibetan plateau it thunders through the Yarlung Tsangpo Canyon, where mountain peaks over 19,000 feet high tower above fierce and relentless rapids. Today, we know that there is no single thousand-foot cascade, although the Hidden Falls, which seem to disappear into a black hole in the Earth, still defy comparison with any other waterfall on the face of the planet. Instead, the river’s secret lies in its constant and dizzying rate of descent. 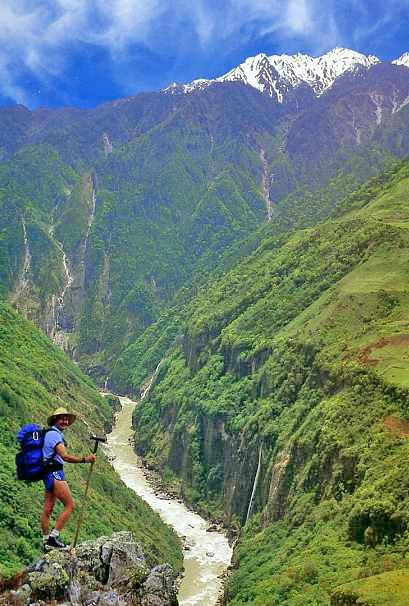 The Yarlung Tsangpo is one of the world’s deepest and steepest canyons, dropping an amazing 9,000 feet over a distance of just 150 miles; where it bends around the foot of Namcha Barwa, its average depth is about 16,000 feet. Even today, precious few people have even glimpsed its raging waters: when two groups of American kayakers risked their lives there in 1998 and 2002, their plans relied largely on images taken from space. In Tibetan culture the Tsangpo gorge is a place of spiritual re-birth, and in this mist-laden air it seems that science and legend are fused. Intriguingly, sandstone rocks just north of the river, near Lhasa, contain minerals that record fluctuations in the Earth’s magnetic field. 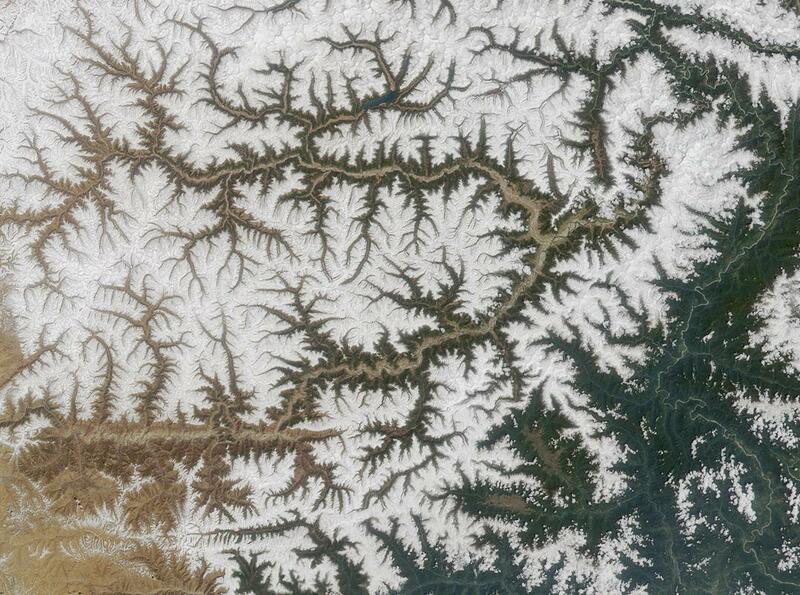 No wonder this is called ‘the Everest of Rivers’. Armed with none of this information, and driven only by a strong thirst for adventure, the first impulse of 19th century explorers was to dive straight into Tibet and solve the mystery. But it wasn’t quite that simple. Alarmed by what it saw as the encroachment of acquisitive nations – Britain among them – Tibet had closed its borders to outsiders, and any westerner venturing into its Himalayan passes ran a real risk of being killed. Undeterred, in 1880 Lieutenant Henry Harman, who was employed by the Survey of India, hatched an ingenious plan. 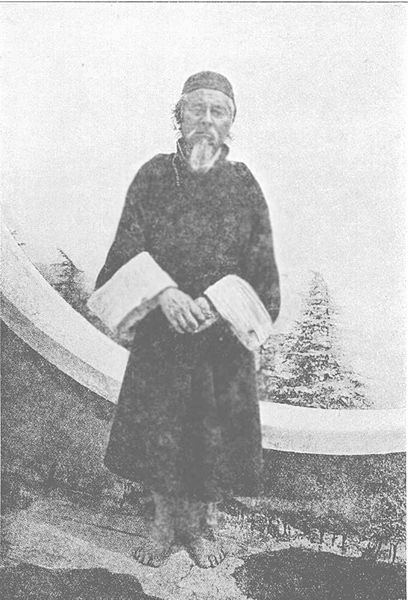 He hired a Mongolian lama (a word liberally used at that time to describe a monk or holy man) and sent him off to the upper reaches of the Tsangpo river, accompanied by a young Tibetan guide called Kinthup. Posing as innocent travellers but acting under secret instructions from the British government, the pair had been given a mission unlike any other. Because, blissfully unaware of the monstrosity of the canyon, Harman had come up with a game of Pooh-sticks on a very big scale indeed. On arriving in the upper reaches of the Tsangpo, Kinthup and his lama-companion were to gather logs and carve them with symbols so that they could easily be identified; and every day for 10 days they were to release 50 of these logs into the river. Meanwhile, Harman had stationed a group of men on the lower reaches of the Brahmaputra, to keep watch for them. What could possibly go wrong? Kinthup returned to the monastery, and on each of the specified days he went faithfully down to a cave where he had hidden the logs and consigned them to the water. But his message was never delivered. Kinthup had been away almost a year, and much had happened during that time. Harman had quit his job, and had since died. His men had given up looking for the logs many months before. In 1884, after an absence of four years, Kinthup returned to his home in Darjeeling and officials from the Survey of India wheedled out his story. He had a photographic memory, and could describe the landscape that he had traversed in extraordinary detail. But the riddle of the gorge lived on, and even in the 1920s it was continuing to puzzle anyone who was ready to be beguiled by blank spaces on a map. 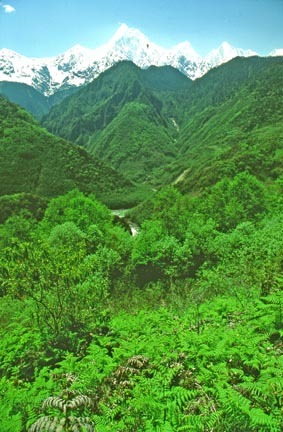 Richard D Fisher in the Tsangpo Gorge, 1994. Fisher made 10 surveying expeditions there between 1992 and 2000. In part two I’ll tell you about Frank Kingdon Ward, an eccentric plant collector, and Eric ‘Hatter’ Bailey, a military officer turned secret agent, who helped to solve the mystery and brought back their findings to share with the Royal Scottish Geographical Society. All images via Wikimedia. 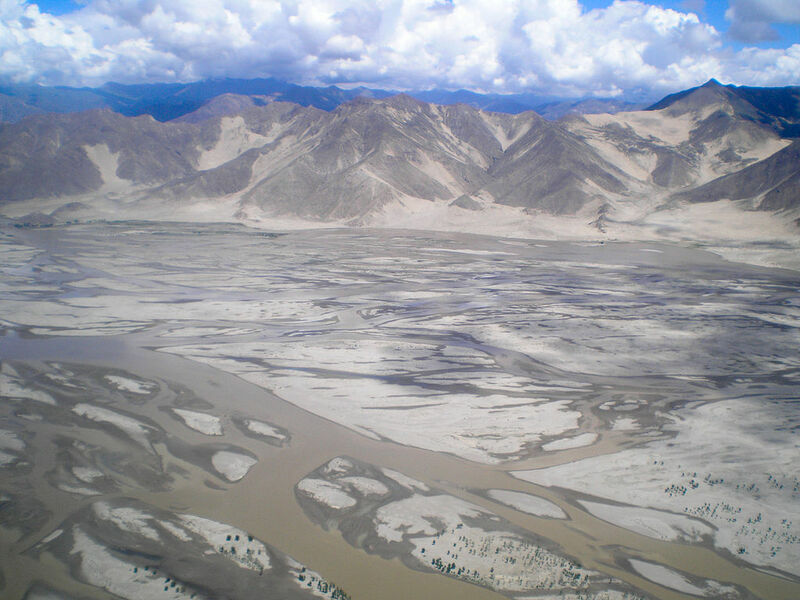 For obvious reasons, there are very few images of the Yarlung Tsangpo Gorge freely available; but if you do a web search for images with the keywords ‘Tsangpo Gorge’ or ‘Tsangpo Great Bend’ you’ll get a good idea of the scale of this place. Poor Kinthup, what a stalwart chap he was. Looking forward to part two. I know, I felt that he deserved some recognition! Such a loyal and humble man.